Quick Disclaimer: Educational information only and not intended to replace ANY advice or treatment from your veterinarian or other medical professional. Please discuss any health problems or concerns you may have with your own veterinarian. If you suspect that there is something wrong with your pug (or any animal), consult with a trusted medical professional without delay. The pug dog truly is one of the most wonderful pets in the world. Generally speaking, pugs are a healthy, resilient breed that often live between 12 and 15 years. Despite that, there are some more common health problems you should be aware of in order to more rapidly identify some of these ailments at an early stage. With general knowledge related to your dog’s health, you can more likely prevent an issue that would hinder your pug’s ability to live the longest, happiest life possible. Pugs are classified as “toy” dogs and are generally small by comparison to other dogs breeds. In length, males tend to span longer than females with an average of 13 to 20 inches (330-500 mm). Female pugs are typically between 10 to 12 inches (250-300 mm) in length and regardless of gender pugs can weigh between 15 and 25 pounds depending on diet and activity. 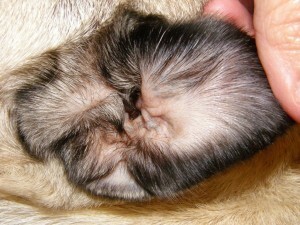 Pug litters are expected to produce around 4 or 5 puppies and owners are NOT supposed to crop the pug tail. Among all pugs, one of the most prevalent concerns relates to body weight. Obesity in pugs is common as these dogs are experts when it comes to meal time. Unfortunately, a pug does not know moderation when it comes to food and as such will eat until they’re sick. Studies conducted by animal food companies have shown a correlation between a dog’s weight and lifespan. Your healthy, in shape dog is expected to live an average of two years longer than overweight dogs and the lean, healthy dogs have shown as less susceptible to health problems. With that, the word moderation is introduced. It is best to not leave food for 24 hour consumption but rather to pick up the food bowl when meal time is over. This will prevent your pug from eating more than what your doctor recommends. A healthy diet and good digestive care includes proper and scheduled doses of preventative flea and tick medication. If your dog begins to exhibit unusual behavior at meal time or any vomiting or diarrhea it may be a sign of some common parasites that affect dogs. General upkeep of your Pug should include keeping his nails short, either by cutting them or perhaps grinding them with a rotary grinder, like a Dremel Mototool. You need to pay special attention to your Pug’s ears and clean them regularly with an ear wash. It is time to see your vet if you notice any redness, heavy discharge, odor, or headshaking. Click here to learn more about common ear problems. You also need to clean your Pug’s nose roll and wrinkles. Skin care should not go ignored and is simple to manage with just basic and inexpensive pet products. You can use some of your ear wash if you are careful to keep it out of the eyes. Some Pugs need their faces cleaned daily, while others can go several days or longer. Sometimes the nose roll gets infected and requires veterinary care. Pug mouths tend to have a lot of teeth in a small space and they may be crowded and out of alignment. Without training, it is not easy to inspect or brush dog teeth however it is important not to neglect this. It may be helpful to ask your vet for any products that are easy to use and for best practices on home health dental care. At GetPuggedUp, our dogs commonly chew on Nylabones and other special bones that help reduce tartar. Also, we have found that there are some special foods that tend to help with bad breath (cottage cheese seems to work but you may find mixed results). Click here for more on dog dental care. With their short little snouts some pugs have trouble breathing, especially if there is a high measure of heat and humidity. They must be kept cool and exercised with caution in the summer. Part of the short-faced or brachycephalic syndrome can involve having pinched nostrils and an elongated soft palate. This is a big deal and you should definitely look at for this. Your vet will need to examine your pug dog to see if the airway through the nostrils is too tight to allow an adequate, comfortable flow of air. If you suspect there is an issue and your vet agrees, there is a surgery that may correct this problem. Watch out for indicators such as excessive snoring or gasping to breathe. These could mean that your pug or other short nosed breed has a soft palate (at the back of his mouth) that is too long in the way of normal functions. Again, talk to your vet about this and know that there is a surgery to help correct this type of problem. While overheating is the biggest weather-related problem your dog may experience, like any person, pugs should also not be exposed to extremely cold temperatures for long periods of time. The royal pug is a dog that was bred to be a housedogs and couch companions/occasional foot warmer. Seriously try to imagine your pug surviving in the wild… Enough said? Although Pugs were not bred to do any specific work to help out man (except provide wonderful companionship! ), like many breeds, pugs are intelligent and very trainable. Think of a cardboard sign, “Will Work For Food” and that is “Pug Training 101.” At dog shows, depending on where you are you may notice pugs competing in every event which they are eligible for, including obedience, agility and even scent tracking. If you check out the Pug Shop, Amazon, and most pet stores you’ll find that there are many helpful training books and even videos available. Heck, a good YouTube search may surprise you and answer a lot of questions. If you need more personalized attention, ask your groomer or vet for recommendations on local training classes. An experienced trainer who uses positive, motivational methods (stay away from negative correction) will ensure that your dog develops good manners in the right way. There are many people that fall in love with a female pug and later decide that perhaps they should breed a litter. Others may get a male and decide that he’s just such a good looking guy that he should be used as stud. Both of these decisions are important and require a serious discussion with your vet, ample research, time and money to cover any health expenses. In terms of quality of life, there is no incremental health benefit to the female to have a litter versus not breeding. Google and experts will share that pugs frequently require caesarian sections to deliver their puppies due to their small bodies relative to their large heads. Any time a pug is used for breeding, extensive health and DNA testing should be done first, including an evaluation of the dog’s parents, to ensure no health problems might be passed on to a future puppy. There is no doubt that pugs are often a prime choice in movies, advertising, and as pets. Plain and simple, they are a popular breed. Because of that popularity, there is also a growing need for pug rescue across the country and abroad. Sadly, unwanted pugs and other dogs are surrendered every day. In many cases, they end up at “kill shelters” and see a sad but humane (hopefully) end. If you let your pugs reproduce, do it the responsible way and be ready to care for and protect any pups that are produced for the rest of their lives… there is no guarantee that your full litter gets a “forever home” outside of yours. Because of this you must be willing to take any dogs back that, for whatever reason, are not longer wanted. 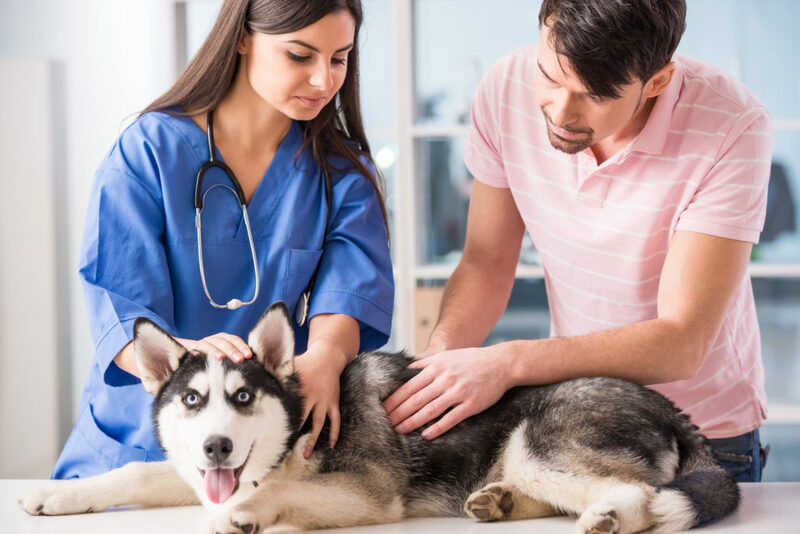 It is often the case that dogs live healthier, longer lives when spayed or neutered and we highly recommend this be done when the time is right.